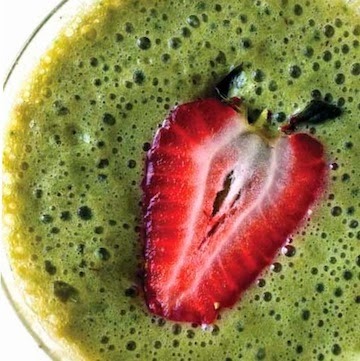 I've made a lot of juices, and I've always loved the green stuff, but I had never thought of throwing some decorative floating strawberries on a smoothie to brighten it up, since I'm usually juicing for only myself these days. I hope that changes soon so I have a reason to serve these! 1. In high-speed blender, blend all ingredients until smooth.